The last time they saw rain was six months ago. 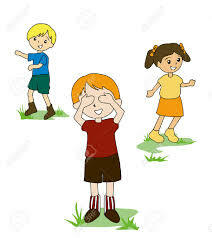 This was why when the wind blew that evening, and dust rose to fill the air, children got excited and ran out of their houses to play Otori – A game of hide and seek. They liked that the dust obscured the view of the seeker as they chose various hiding places.They also harboured thoughts of dancing in the rain afterwards, sticking out tongues to catch the icy drops. Of these children, was Okiemute. He sneaked out of the house without a word to his eldest sister, Nyore who was busy in the kitchen extracting juice from palm fruit for banga soup. Smart child, he left his slippers at the entrance to the house to give the impression he was indoors somewhere. Neighbours ran out to protect their items from the looming rain. Fowls squawked in their cages to add to the chaos; a goat tied to a pole in the corner bleated incessantly. Still, Okiemute skipped on to meet with other children of the town. Okiemute was chosen as the seeker. He closed his eyes and counted aloud, 1 to 10. When he opened them, his friends were nowhere. There was a low rumble followed by a flash of lightening that ran jagged across the sky. He knew had to seek them. The rain had started to pour heavily when Mama Nyore got home. The smell of Banga soup filled the parlour. “Vrendo” her mum answered, lowering her bulk into a nearby seat. “Yes Mama. I go bring your food now now.” she said, making a dash for the kitchen. Mama Nyore descended on the clay pot of sizzling banga soup and starch placed before her. Nyore joined her. Half-way into the meal, Mama Nyore realized she hadn’t set eyes on her son. “Mama easy now, you wan choke on top this pepper ?” Nyore asked. Nyore opened her mouth to receive the piece of meat from her mother’s fingers like Holy Communion. She returned a while later to say that she did not see Okiemute. The rain still poured heavily outside. “Nyore, wey Okiemute? I leave am with you for this house o.” She queried Nyore. Nyore had no answer. She stared petulantly at the floor, swearing within to pull Okiemute’s ears for his mischief. After finding three of his friends, Okiemute was not content. He was bent on finding the last one. Rain lashed across his face blinding him, but he persisted. He suspected the last person might be hiding at the town hall which was a few feet away and ran there. He looked round but it was too dark to see beyond his feet. In fact, he only knew where his feet were because he owned them. He sat on a step and tried to be brave. “The rain will soon stop”. He thought. Mama Nyore was now irritated by her son’s absence but she was not worried; Otutuama was a peaceful town, and everyone knew everyone else. Her only concern was the rain. She closed her eyes in prayer for the safety of her son. Okiemute was cold. He regretted leaving home without his slippers. He pulled his knees up to his chin and with his back against the wall, fell asleep. He didn’t notice that water had risen up to the step where he sat. When Mama Nyore felt something brush against her feet, she opened her eyes and saw the pool forming. They bulged at the sight. She raised a lantern from the stool beside her and peered at the clock. It was 6 o’ clock. How could she have fallen asleep? She thought. Rain still pelted the roof. She heard cries in the distance and went in to wake her children. Okiemute was not there. She hoped he was in Tega’s house. Tega was his best friend. Nyore grabbed an umbrella and headed for the door. She opened the door and water rushed in carrying flotsam. Her mum ran out to find Okiemute lying still at the door, his stomach distended. This entry was posted in FICTION and tagged #DeltaLife, #Fiction, #Flood, #Talesabouthome. Bookmark the permalink. This is from a brilliant mind! Thanks Rex. Glad you liked it. The tragedy is beautifully built. Anticipated, yet the writer held me by neck. And the characters, I swear I think I’ve seen Okiemute before. Thanks so much Nel. I really appreciate this. Wow like seriously, takes me back to my childhood days. Had to read it twice cause of the suspense. Him owning his feet…knowing where they were….being stupidly bold..sigh…. Come to think of it, we were all him at some point in time. WOW! The flood carried his body right to his mother’s doorstep??? *chills*… Great work RolZ! Amazing. Ehen! And you are kinda the first person that understood the true picture of the flood carrying him to his mother’s doorstep. Such a tragic end but beautifully written. Am not really a fan of suspense after such wonderful story that got me glued. Looking forward to the continuation. Thanks for reading Tayo. Thank you. I love love love this piece. But did he have to die? Really Roli? I understand the concept of suspense BUT REALLY??? Okpe… I am sorry I broke your heart. ‘maye… well done. Torrential downpour and flotsam reminds me of Lekki. The protagonist found bravery in his bravado. Such beautiful tragedy. Can’t believe the flood took him straight to his door. I can only imagine the mother’s reaction. Weldone! Thanks dearie. Glad you enjoyed the story. Really interesting story,was just hoping it wouldn’t come to an end. Nice work Roli, keep it up. Lovely piece. When is the next part coming out? Roli. ….. you have never ceased to dazzle me with your beautiful stories. You are definitely going places. Keep it up, our very own Chimamanda!!! We all acted okiemute as kids…. Thanks for the memories. .. Thanks so much Abdul. I appreciate. I saw this link all over twitter but didn’t bother till Nel Ibuola practically pushed me into it. I love it, yet I’m angered. Why must death be brought to the doorway? Hello IyimEli, thanks for reading my story. I understand your grievances. Unfortunately, that was how the story wanted to be told. I hope I make you happier with my next story. Y now?the story brought back memories from another time.not liking the end but he isnt dead now is he? Nice one Roli, but i’m like how the story ends, i feel like reading it on and on. My chef!!!! This is a great story. This was beautifully told. Well done, Rolz!!! What a cataclysmic story. Took me back to playing in the rain with my siblings as a kid, then broke my heart with the death of Okiemute. Death always comes knocking at some point, no? Yeah it does… glad you liked. wow. am astonished buh certainly not surprised. I know you’ve always had this in you. believe it or not you are a force to reckon with Roli and I just can’t wait to read about you on a bigger and better platform. deam this just blessed my night arrrrrrgh. It’s simply Profound. Thank you so much for the encouragement Simon. I appreciate. You epitomize these great words of W. Shakespeare.